Angela Wanpen Anderson, 22, of Champaign, IL passed away Monday, December 28, 2015 at Carle Hospital in Urbana, IL.Angela was born on March 17, 1993 in Urbana. 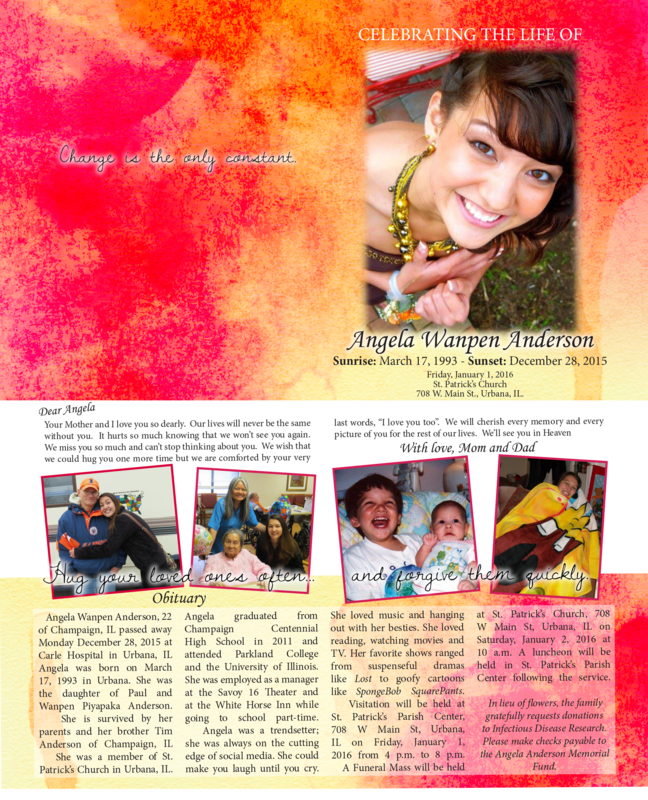 She was the daughter of Paul and Wanpen Piyapaka Anderson. She is survived by her parents and her brother, Tim Anderson of Champaign, IL. She was a member of St. Patrick’s Church in Urbana, IL. Angela graduated from Champaign Centennial High School in 2011 and attended Parkland College and the University of Illinois. She was employed as a manager at the Savoy 16 Theater and at the White Horse Inn while going to school part-time. Angela was a trendsetter; she was always on the cutting edge of social media. She could make you laugh until you cry. She loved music and hanging out with her besties. She loved reading, watching movies and TV. Her favorite shows ranged from suspenseful dramas like Lost to goofy cartoons like SpongeBob SquarePants. The family gratefully requests donations to Stevens Johnson Syndrome Research .